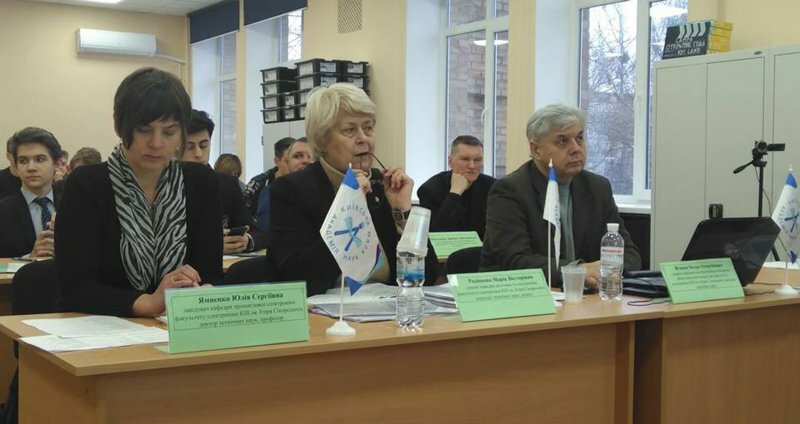 The finale of the regional stage of the research works competition in the section “Electronics and Instrumentation” of the Department of Technical Sciences of the Ukrainian Junior Academy of Sciences was held at the children's school of microelectronics “Lampa Kids”, based on the Faculty of Electronics. This competition is held with the aim to identify and support gifted student youth, attract it to scientific research and create conditions for self-realization of creative personality in modern society. Regional stages traditionally take place on the basis of institutions of higher education, institutes of postgraduate education, etc. By the way, among the best students and graduates of our university there are a lot of those who, while studying at the school, participated in the defense of the scientific works of the JASU. Students, the winners of the competition at their lyceums, schools and gymnasiums, presented their copyright projects for consideration of a respectable jury in the Igor Sikorsky Kyiv Polytechnic Institute. Young researchers defended their works, proving relevance and significance of the chosen topic, showed their knowledge and skills. Their research was up-to-date and interesting, and stood out with solid scientific thinking. It should be noticed that the level of professional competence of jury members is high. They have many years of scientific and pedagogical experience, in particular, with students' research work, and in the substantive commissions of the scientific competition. The achievements of the schoolchildren were evaluated by the scientists and teachers of the Kyiv Polytechnic Institute: J.S. Yamnenko, Dr.Tech.Sc., professor, head of the department of industrial electronics; M.V. Rodionova, Ph.D., Associate Professor of the acoustics and acoustic electronics department; S.A. Nayda,., professor of the acoustics and acoustic electronics department; D.A. Mikolayets, Ph.D., Associate Professor of the department of Industrial Electronics. The head of the jury was P. Y. Yaganov, Ph. D., Associate Professor of Design of Electronic Computing Equipment of Faculty of Electronics. They listened carefully to the defending speeches of young researchers, bottomed their design, asking additional questions and providing appropriate advice and clarifications. The winner was Myhailo Tatarnikov from Kyiv-Pechersky Lyceum №171 “Leader”, who explored the possibility of using an external combustion engine to ensure the continuous operation of gas boilers. He will submit his work to the third All-Ukrainian Defense Contest in May in Kyiv. Boris Arakelyan (from gymnasium number 153 named after A.S. Pushkin) took the second place for the device of research of the heart for the detection of cardiovascular dysfunction on the basis of ECG technologies, and the third took Vladislav Shevchuk (gymnasium “Academy”) for the algorithmization of the process of determining the geographical coordinates and speed of moving objects using a GPS receiver. The prize-winners of the intellectual contest are ready to prove their right to win in the next year, improving their projects in “Lampa Kids”. For this purpose, all conditions for engineering in the field of electronics, robotics, electronic and computing equipment, and microcomputer programming are created. We wish them perseverance and inspiration for the achievements of new victories. In addition to identifying and supporting gifted children and preparing for future scientific change, this event has given an opportunity to all those present people to positively adjust to further inspired and fruitful work.